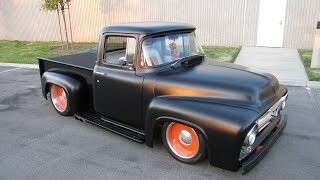 This American Made 1953-1956 Ford Pickup Custom IFS is engineered for easy installation, enhanced drivability and broader range of alignment adjustments. This front end is based on our Custom designed spindle with divorced steering arms and proprietary geometry to maximize comfort and performance. The offset stainless eccentric adjuster provides easy camber and caster adjustments. Available with dropped or stock height spindles to provide a ride height that matches your specific desires. 1,000,001 Mile Warranty Ridetech Coil-over shocks come standard and provide further height adjustment and 26 way ride comfort control. One piece crossmember design makes installation much easier. Just take a few mesaurements and place the crossmember into position.